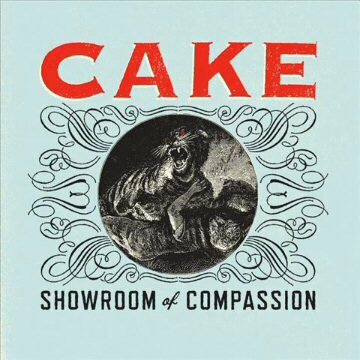 I waited so patiently for 4 years for a new Cake album. I've really loved their whole discography from 1994's Motorcade of Generosity to the B-Sides & Rarities compilation album that came out in 2007. 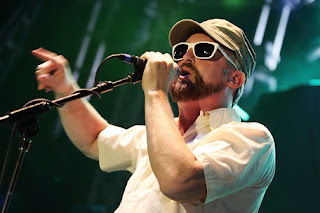 I love the dry, almost spoken, delivery of frontman John McCrea's singing. I love Vince DiForce's addition of trumpet and keyboards to the music. I love that the music is witty and fun. In 2008 the band decided to remove Cake's studio from the dependence of California's electricity grid and go 100% solar. This must make recording only possible in for a few hours during the day, since it took another 3 years for them to release their next album titled Showroom of Compassion. Released it is though, on January 11, 2011 to a NUMBER 1 spot on the Billboard charts! Wow! That must feel great to have your "comeback" record receive such praise. Except that it will own this distinction with an asterisk. You see, it broke a record for being a number 1 album with the lowest sales in history. 44,000 albums was all it took to secure a number one spot that week. That's 2,000,000 less than the biggest opening week an album has had according to Billboard. (N-Sync March 2000). Showroom of Compassion, even after all the hype, ends up being somewhat uninspired. I'll showcase this by sharing a great song and a song that I call the Taco Bell of the record. More filler than beef. Let's start with the waste so we can end on a good note. The opening track on SOC almost made me turn the CD player off. What garbage is this? The song is called "Federal Funding" and the lyrics, the music... all just amazingly boring. The big instrumental finish of the track saves it a bit, but it's my opinion it could have been left off the album altogether. The best track on the album, ends up being what should have been the opener. Track 2 is called "Long Time" and that's the opening track title for a "comeback" album. Maybe Cake, like LL Cool J, doesn't want us to "call it a comeback". I call it like I see it, and this is the perfect opener. "Long Time" is the track that will crystallize the experience of the rest of the album. It has all the Cake-like elements of greatness. The distinctive talky-singing, the bass slap, the jittery guitar riffs, the trumpet, the synth keyboards, ticking clock sounds, a glockenspiel. It's all here. Isn't that a great Cake song? Makes me want to see them live again. It's been a long time since I have seen the band Cake on tour. I'm hoping for a tour stop near enough for me to see them again. One thing I am sure hasn't changed is the great live show Cake is known for. Amazon has the album on sale right now...only $7.99! If you are a Cake fan, you need this one for your collection, and at that price I don't think you should pass it up! Need more of a push to buy the album? Check out the new video for the official first single from the album. we are pleased to have you!